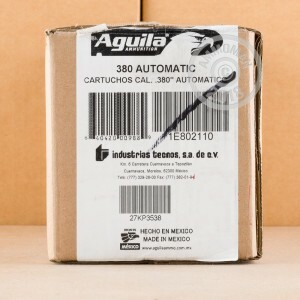 These Mexican-made .380 Auto loads are from Aguila are a prime choice for plinking, target practice, and even IDPA's back-up gun (BUG) side matches. Component materials are chosen based on Aguila's experience which dates back to the 1960s. 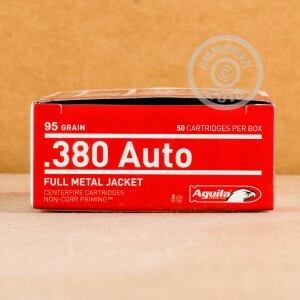 The cartridge is headed with a 95-grain full metal jacket (FMJ) bullet which will work great in a slimline carry gun like the Remington RM380 or a transferable machine gun like a Mac-11; this is not only due to smoothed, rounded surfaces but a weight rating which matches the majority of range loads and self-defense options in the caliber. Each FMJ projectile is contained within the crimp of a brass casing which can be de-primed, cleaned, reprimed, and completely reloaded after firing. The casing is accompanied by a non-corrosive Boxer primer at its base which will leave behind zero caustic substances that could otherwise harm your bore and action. 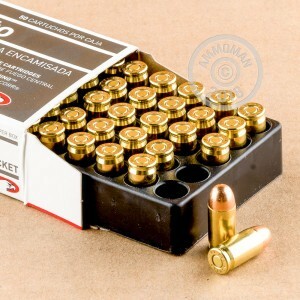 Buying in bulk with this 1000-round case will afford you plenty of ammo for consistent practice and competitive use. While Aguila is primarily known for their low-cost and high-performance rimfire lines, they also produce centerfire ammo that is marketed towards professional competitors and law enforcement organizations.